A modern twist on a TEDCO classic! And, the most precision-designed toy gyroscope on the market. Utilizing a precision plastic wheel and frame with ball bearings, this Precision Gyroscope is simply amazing in its performance, able to spin for several minutes. Amaze your friends with these gravity-defying tricks – stand on end, high wire, in the loop and dual gyroscopes. Best of all, this gyroscope can be started with the T handle for super ease in spinning for beginners. Durable enough for classroom demonstration. Includes precision gyroscope, stand, string and T handle. Busy hands build busy minds! And there is no toy better than the precision gyroscope to engage both the hands and the minds of youngsters. Children are curious by nature and one of the best ways for them to learn is by asking "how does it work?" 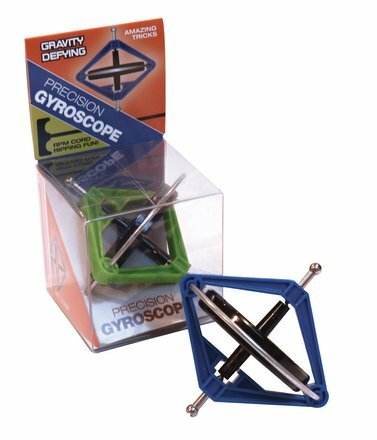 The gyroscope sets out to help kids investigate the amazing scientific principle of gyroscopic force and to reinforce learning through hands-on exploration. By building problem-solving skills children develop a thirst for additional learning and educational experiences.